"Adequate storage" are magic words almost every homeowner longs to hear. Surprisingly, we found it in abundance at the 41sqm studio of Stephanie. In this compact condo home, every inch of space is accounted for and clutter is just a bad word left outside the front door. Step inside and you'll face a sea of neutrals where the air is calm and everything seems right in the world. "I told [designers] Frenjick Quesada and Chako Hirayama (of Design HQ) that when I walked through the door, I wanted that there would be no stimulation at all. I want a home where I could empty my mind," Says Stephanie. This request translated to a minimalist space characterized by clean lines and custom-made furniture pieces that do double duty as storage. 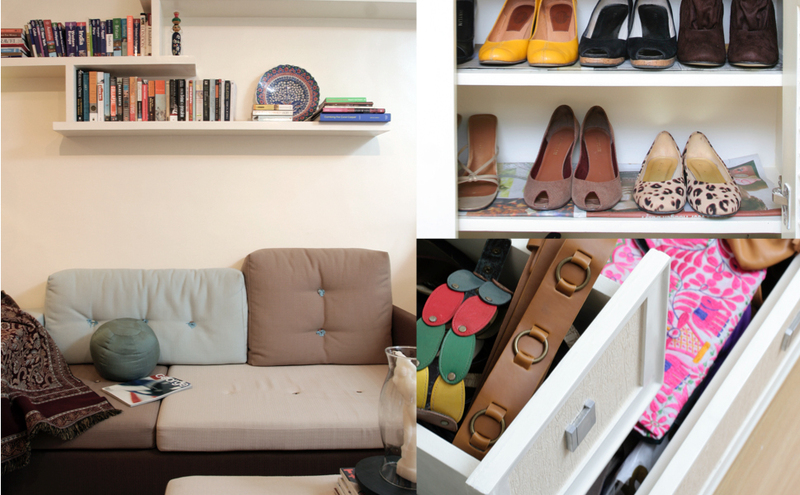 “I’m very obsessive-compulsive about storage,” adds Stephanie. “I wanted all the storage to be multi-purpose.” The unique, built-in storage units and cleverly organized living, dining, and sleeping spaces resulted in an organized and cozy home that is refreshingly modern and bright.